- Exclusively for Kuching Food Critics members. - Members must show the cover photo to entitle discount before purchase. - Each members only entitle to one voucher. * Management reserve the right to amend the Terms and Condition without prior notice. **Entitlements of free vouchers are subject to Management final decision. *** Promotion period – 25 December 2013 to 31 December 2013. **** Not valid for delivery and stamp collection. Wakakakakaka!!!! MERRY CHRISTMAS everyone!!! Haven’t found a nice place to celebrate this joyous occasion? Thinking of somewhere not too quiet ‘n’ not too loud? Looking for somewhere where food is good but wallet-friendly? Think no more! 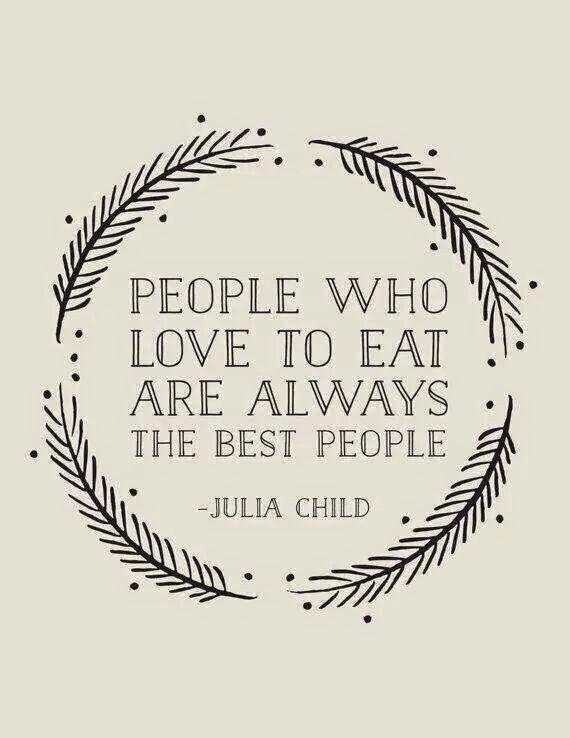 As @Wakakakaka Café is just the place you are looking for!! 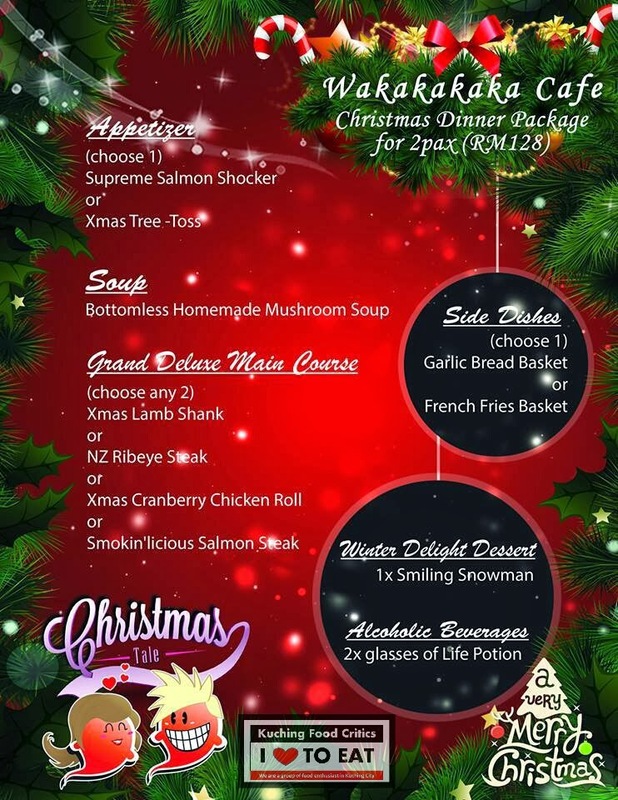 This Xmas Dinner Package comes with One-of-a-kind salads, FREE-FLOW unlimited Mushroom Soup, 4 luxurious Main Courses to choose from, additional Side Dish, Homemade Special Ice-cream Dessert, and best of all… 2 glasses of LIFE POTION!!! All of these for only RM64 per pax. KFC members who whisper to our staffs: “Wakakakakaka!! I am a KFC Member! !” will get an extra refill of LIFE POTION. Limited to one refill per person. Like their page at https://www.facebook.com/pages/Wakakakaka-Cafe/326732700780705 for extra information. Contact or SMS (014 – 325 3825) to make a reservation or any other enquiries. "WOWWW !!! New Promo for all Kuching Food Critics members this week." # Tomato Honey Ice Blended at only RM6.90 (Original Price at RM7.90). 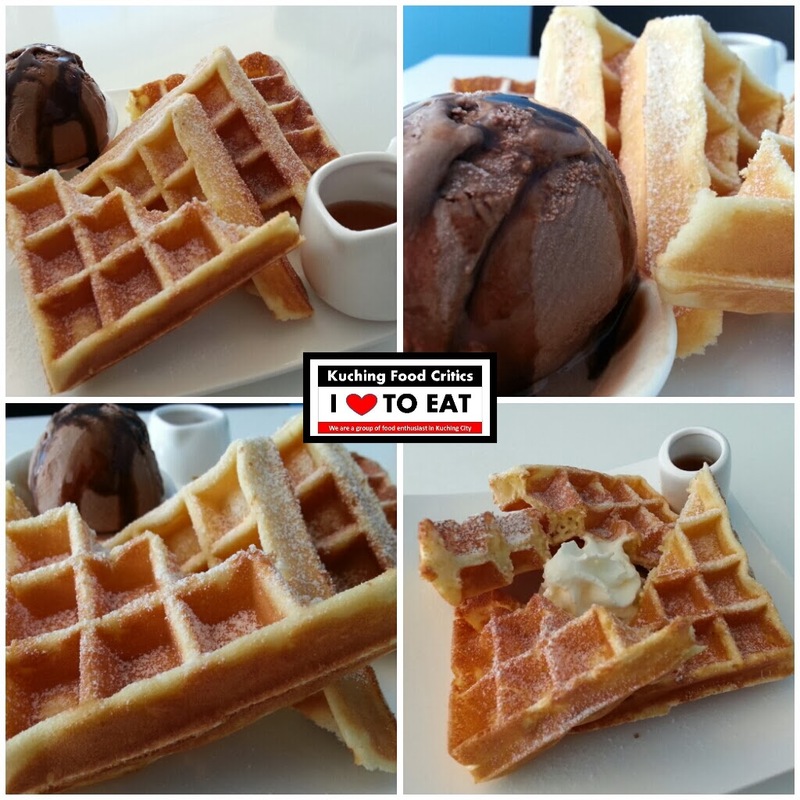 (1) Like "Kuching Food Critics" Group and show to Georg Peck staff during your order. 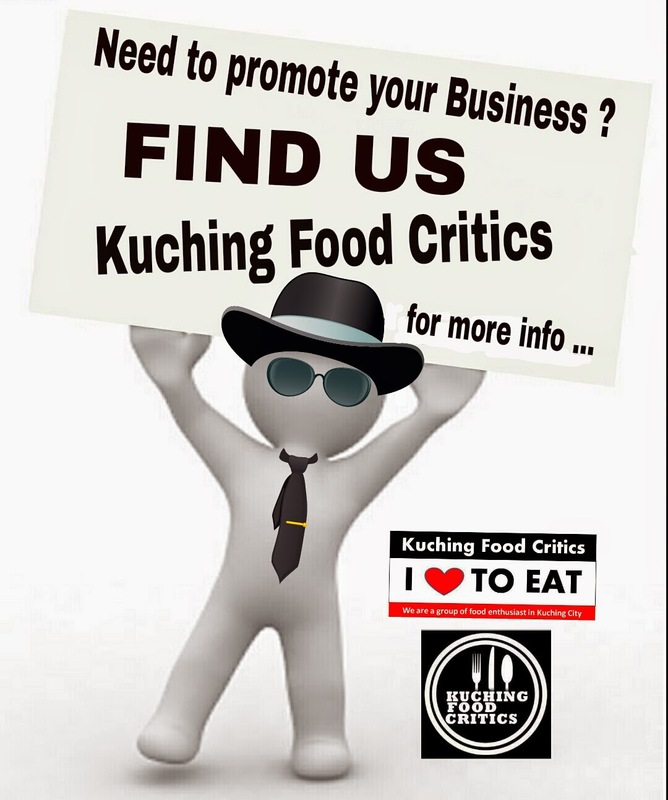 Do you know that all Advertisement Fees or Profits earned by Kuching Food Critics will be use for Charity Purposes or any other events or activities which will be going to be organize in future for the benefits of everyone in the group ? We, The Admins of Kuching Food Critics won't use even single cents of our profits for our own benefits or whatsoever.. In Kuching Food Critics, All the Admins is Volunteering in doing all this is for 3 Purposes ! 3F Concepts ..
FUN - FRIENDSHIP - FOOD ! For your information, Kuching Food Critics & some of our Active members here will join be working together in Sponsoring Cash Money and then to Buy and pack the presents and will distribute all the presents to the Paediatric Ward patients at Sarawak General Hospital coming this 22nd December 2013 ? and Ohh Yes ! Our Kuching Food Critics, CEO, Mr. Ong will be the Santa as told/selected by the Organizer.. LOL ! 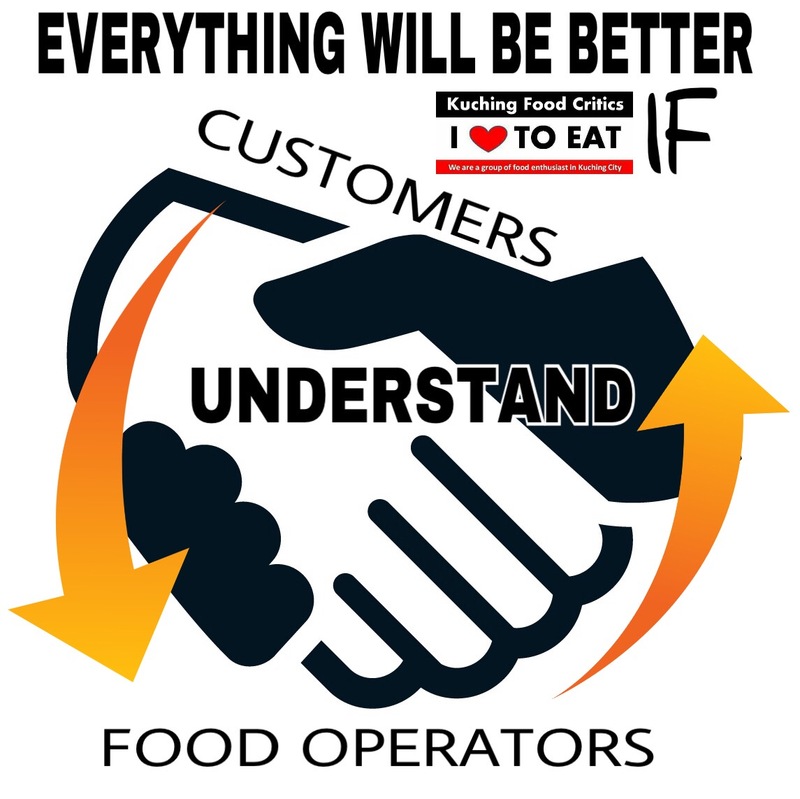 We would like to Thanks every members here for giving & showing your supports towards the Group & to those Food Operator who had pay to advertise in Kuching Food Critics, The money that you spend is for the good meaning use !